Today, id like to talk about what im careing about in this season now. On changing seasons, i think especially girls care about the skin care. 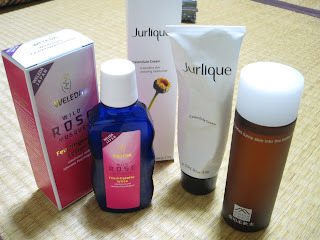 And as for me, since I have a Super Ultrasensitive skin, now i try to choose 100% natural skin lotion for my skin care. In the picture, the all lotion made by the 100% natural things, and since i have been using those stuffs, my skin has got to be mild, and not much sensitive than used to be. Now, i also got to respect Nature power a lot ,too.!! !